Typical legal system scam used and abused by dishonest and unethical lawyers, judges and police. To resign to keep benefits allowing the scum to find work in another state and continue to abuse the law and violate rights and the law. John R. Crowley a criminal defense attorney whose Tri-City cases included several homicides and serious assaults has given up his law license after several findings of alleged misconduct. John R. Crowley submitted his resignation in lieu of discipline effective Sept. 18. Crowley wrote that rather than defend against the allegations, he was voluntarily resigning his membership in the Washington State Bar Association. There are five cases in question and a total of 20 counts of misconduct, but none involve any cases in the Mid Columbia. Crowley is accused of, in once case, pocketing $23,500 from a client facing drug and gun charges, but the complaint says he little or no work and often had other attorneys stand in for him. In another case, he was supposed to represent a man accused of computer equipment theft. But he gave him the ‘run around’, even telling him to show up in court but didn’t show up himself. He reportedly delayed the investigating detective with lies and misleading information. The charges involve activity in Idaho federal court, as well as Kittitas, Island, Pierce and King Counties. Crowley represented Tyree Q. Houfmuse in the 2015 shooting outside a Kennewick bar that left the ex-boyfriend of Hourmuse’s girlfriend paralyzed. He also represented in 2014 Kenneth Baird, one of four Hanford workers accused of timecard fraud. Baird was acquitted. However, one of his clients, John C.I. Young, lost his appeal in the July 4, 2013 fatal Horn Rapids area shooting of Joshua Snapp. Young later claimed Crowley was ineffective as his attorney. He was involved in two other prominent area cases as well. A criminal defense attorney who defended the suspects in the 1985 murders of Wilhelmina “Minnie” Maurin and Edward “Ed” Maurin’ and the death of Vader toddler Jasper Henderling-Warner in 2014 has given up his law license after several findings of alleged misconduct. Crowley wrote that rather than defend against the allegations, none of which were based on his work on cases in Lewis County, he was voluntarily resigning his membership in the Washington State Bar Association. He was admitted to the state bar in November 1990. Since it is a permanent resignation, Crowley no longer can practice in any jurisdiction where he was licensed, including both state and federal courts. He also is subject to all restrictions that apply to a disbarred lawyer. Crowley’s filing came just days after he appeared in Franklin County Superior Court for the sentencing of Mary A. Faucett. His client, who’d taken a plea deal for first-degree manslaughter, got nearly 11 years in prison. Crowley could not be reached Monday. The phone numbers for both his Seattle and Yakima offices have been temporarily disconnected. While he still has a live website, the attorney biography page has been taken down. Pam Loginsky, the staff attorney for the Washington Association of Prosecuting Attorneys, alerted all county prosecutors of Crowley’s move in an email Monday morning. She advised them to immediately schedule hearings on cases where Crowley is the attorney of record. She also told prosecutors to anticipate seeing personal restraint petitions, motions to withdraw guilty pleas and other appeals in which the defendant argues that Crowley was ineffective on their cases. Loginsky reminded prosecutors that the 9th U.S. Circuit Court of Appeals has said an attorney’s disbarment or suspension alone does not require a finding of effectiveness. 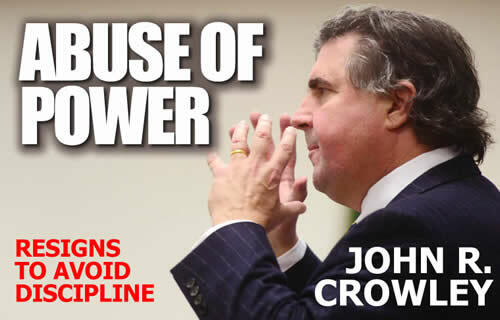 According to a 16-page complaint prepared by the state bar’s Office of Disciplinary Counsel, Crowley took money from new clients but failed to file necessary paperwork in their cases, ignored repeated calls, text messages and emails from the clients and other attorneys, and lied about his actions. The cases were out of Grant, Kittitas, Island, Pierce and King counties, and federal court in Idaho. In one case, a man under investigation for theft of computer equipment hired Crowley and said he wanted to resolve it before any arrest because he already had enlisted in the National Guard. Crowley did not respond to most follow-up calls and texts from the client and repeatedly delayed the detective with lies, the complaint shows. He claimed the client was going to surrender but never actually set it up, then told the man to be in court so he could get the arrest warrant quashed, but didn’t show up himself. That went on for more than a year before the client fired Crowley. The complaint also shows that Crowley pocketed some of the money he was paid, instead of putting it into a separate trust account as is required of lawyers. He received $23,500 to represent one man on felony gun and drug charges, but “did little or no work” other than requesting continuance and asking other attorneys to stand in for him in court. In 2015 in Kennewick, Crowley successfully defended Tyree Q. Houfmuse against a first-degree assault charge for a Thanksgiving eve dispute outside a Kennewick tavern that left his girlfriend’s ex paralyzed. While the jury found he acted in self defense when he fired six shots, they convicted him of felony gun possession.